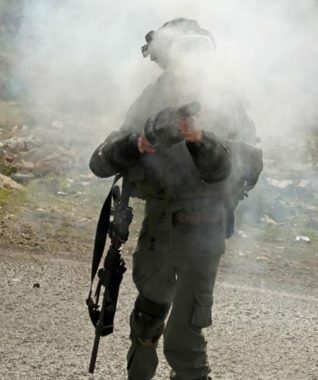 Dozens of Palestinians suffered the effects of tear-gas inhalation, as Israeli forces suppressed the weekly Kafr Qaddoum march in the northern West Bank district of Qalqilia, on Friday afternoon. Coordinator of the local popular committee of Kafr Qaddoum, Murad Ishteiwi, said that Israeli forces showered protesters with tear-gas bombs, in addition to opening fire with both live ammunition and rubber-coated steel bullets. Ishteiwi added, according to Ma’an, that confrontations erupted between hundreds of Palestinian youth and Israeli soldiers, during which Palestinians threw rocks and empty bottles. Israeli soldiers went up a mountain overlooking the homes of the village, and proceeded to throw tear-gas bombs. The march was set off from the Omar Bin al-Khattab Mosque, following Friday prayers; hundreds of locals and international and Israeli activists took part in the march, along with a group of Korean journalists who are filming a documentary on the Palestinian-Israeli conflict. Residents of Kafr Qaddoum began staging weekly protests in 2011, against Israeli land seizures, as well as the closure of the village’s southern road, by Israeli forces. The road, which has been closed for 14 years, is the main route to the nearby city of Nablus, the nearest economic center.